A dramatic comedy with an engaging ensemble cast, Steel Magnolias is a talkfest that covers a lot of ground, but rarely achieves any significant forward momentum. In small town Louisiana, Shelby Eatonton (Julia Roberts) suffers from severe diabetes, but is preparing to get married. Her mother Mary Lynn, better known as M'Lynn (Sally Field), is close to her daughter, and worries that Shelby's life may be in danger if she ever decides to try and have children. M'Lynn's friends are the town's hairdresser Truvy (Dolly Parton), the local wealthy sophisticate Clairee (Olympia Dukakis), and the slightly off-kilter, always frazzled Louisa, better known as Ouiser (Shirley Maclaine). Truvy is married to the frequently absent Spud (Sam Shepard), while Ouiser has a long-running feud with M'Lynn's husband Drum (Tom Skerritt). A newcomer to the group is the young Annelle (Daryl Hannah), who gets a job at Truvy's salon despite a seemingly dark past. The women spend a lot of time talking and helping Shelby prepare for her big day. After marrying Jackson (Dylan McDermott), Shelby does indeed get pregnant, and delivers a healthy child. Meanwhile, Annelle goes through a wild period before finding religion. And suddenly, M'Lynn's world is rocked by tragedy. Steel Magnolias is an adaptation of the play by Robert Harling, which he wrote to help cope with the real-life loss of his sister to diabetes. And the movie carries a sincere heart, depicting real women coping with the joys and tears of the real world to the best of their abilities, supporting and comforting each other through the bad times, and celebrating the good times together. In between they gossip a lot, poke fun at each other, and talk through all the issues in their lives and throughout the town. As a women's view of middle class life in a quaint small southern town, there is little that is missing from Steel Magnolias, but the charm of life drifting by is also the film's weakness. Director Herbert Ross cannot find much impetus to push the narrative forward. Other than the central relationship between M'Lynn and Shelby, the rest is just so much fluff, and as the story waits for something to happen, the fluff gets fluffier and grows to fill all the corners of the screen. Truvy, Clairee, Ouiser and Annelle occupy a lot of time and space, but ultimately contribute very little, and their stories are truncated at both ends, their true purpose limited to just being friends of M'Lynn. Harling and Ross do find success in opening up the play and expanding the set of characters. Outdoor scenes add colour, and many husbands and boys are introduced. 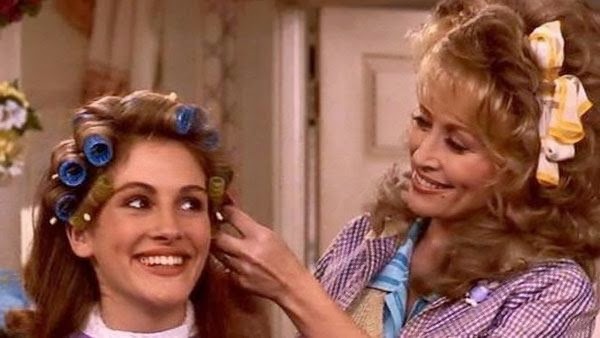 Although they inject some testosterone into the flowing rivers of estrogen, Steel Magnolias remains solidly a women-dominated film, the likes of Spud, Drum and Jackson mostly serving as comic relief or dissolving into the furniture. The cast is uniformly good, Sally Field unleashing a couple of emotional hurricanes towards the end, while Julia Roberts is more understated in facing her challenges. Dolly Parton, Olympia Dukakis and Shirley MacLaine compete for screen time in fairly one-dimensional roles, while Daryl Hannah goes through all sorts of transformations without ever quite being sure what she is doing in the movie. Hannah does, however, hit one high note opposite Field, with the two women standing at the epicentre of M'Lynn's tragedy. A sweet visit with some great actresses, Steel Magnolias is always pleasant and sometimes poignant, if never profound. I actually liked this one a lot and more than mystic pizza. My second favourite Julia Roberts performance as Shelby with Erin Brockovich as #1. I found it OK...but just OK!